We mastered the art of train travel in Europe with kids through Austria and Switzerland on our recent two week adventure. Traveling by train made this trip one of the most enjoyable and relaxing that we have ever taken! 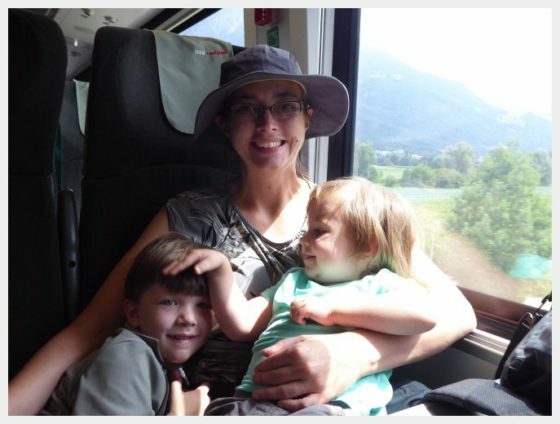 Train travel in Europe with kids was much more enjoyable than driving or flying. We were all able to move around and enjoy the scenery instead of having one person stuck behind the wheel and two kids stuck in car seats. If you enjoy this, here is some of the other great information that I have been putting together about our trip to Switzerland! Being able to get up to look at the beautiful scenery passing by outside the window while the kids played games or slept made the train travel in Europe with kids one of the highlights of the trip. We had room to spread out and relax. Train stations are also easier to navigate than airports with toddlers. There usually is minimal security and you are not limited by restrictions on baggage as to how much you can bring with you. 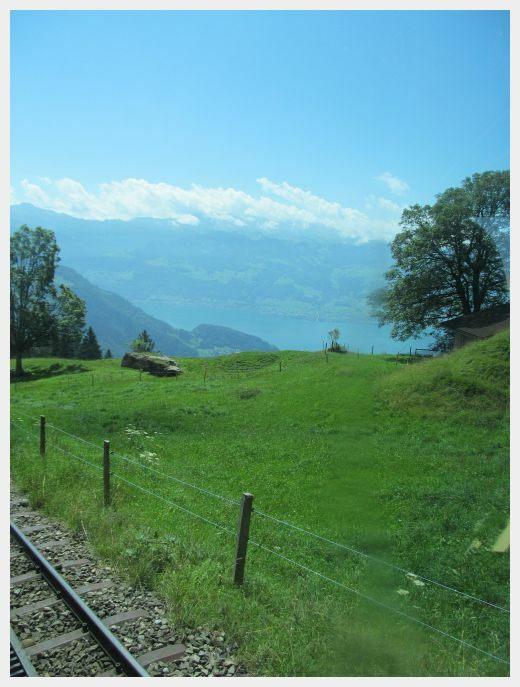 The train network in Switzerland is extensive and flawless. Trains come and go like clockwork, and connections are easy and relatively effortless. When we did need to connect, most of the time we just had to hop across the platform or onto a nearby bus. We had a few days during our trip to Austria and Switzerland where we were taking longer train rides going between destinations. Because we were moving to a different hotel, we had our baggage with us and these train rides were more intensive and exhausting. In the future, we are going to try to plan out travel so we stay in one place longer and have less of these “travel” days. Things went more smoothly on these days when we got the kids up and out early to do an activity in the morning, had lunch and boarded the train just after lunch time. They would often nap, and we would still get to our destination in time to check in to our next hotel, settle in and have dinner (many hotels may not be able to check you in until afternoon, anyway). Not all trains were busy, but enough of them were to warrant getting to the platform and boarding the train as soon as possible. This allowed us to get seats together and not feel rushed. If you are rushing and the train is full, often there is another train leaving soon for the same destination. We wished that we would have waited a couple of times for the next train rather than suffer without seats on a full one because we had rushed on at the last minute. Had we stopped to check, there might have been another train leaving for the same destination in the next 15-20 minutes! When you get on the train, you will probably stow most of your things above you in racks. While not inaccessible, it is more convenient if you are not jumping up and down to grab things out of your bag all the time. Pack a small backpack or other carry on bag with snacks, toys, tablets and anything else that you think that you will need during the ride. I always like to keep a few extra special treat/snacks/toys up my sleeve for when the kids get to the end of their travel rope and you still aren’t to your destination yet (we had a couple of travel days like this and these extras helped to soothe the cranky kids until we could get to the hotel). 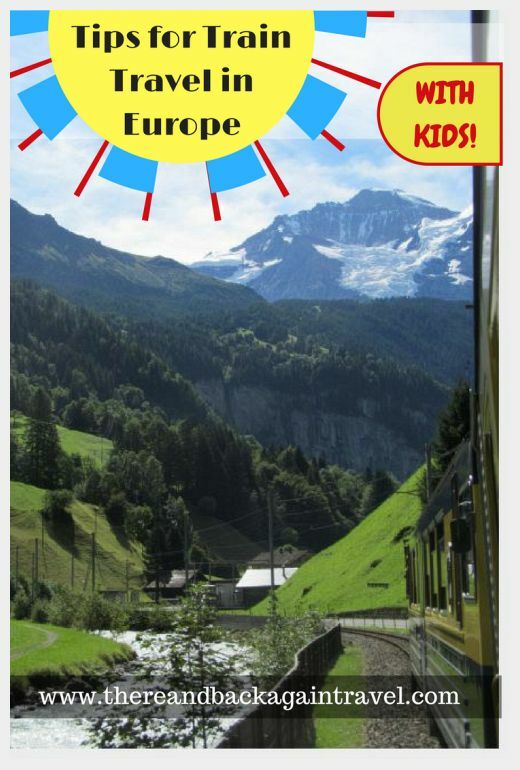 Get Your Kids Involved when planning train travel in Europe with Kids! 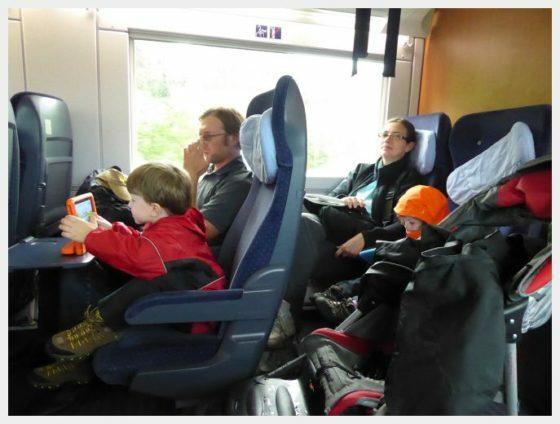 Train travel in Europe can be a great learning experience for kids. Get them involved by showing them a map of your route and which stops will be in between. Show them how to read the departure boards in the terminals. You could make up scavenger hunt cards with things that they are likely to see on the train and outside the windows as you travel and see how many they can check off! If the train pulls in to the station and there are already a ton of people waiting to board, you will get the best seats if you walk down a ways and wait from the middle to far end of the platform. 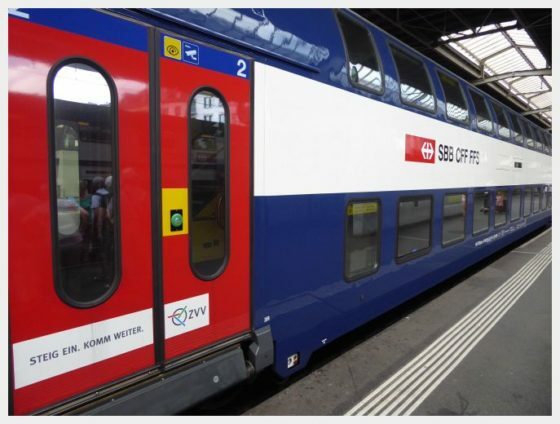 On many of the trains that we rode in Austria and Switzerland, the first few cars were reserved for first class passengers. When the folks that were standing there waiting who were not in first class realized this, they all moved down filling up the first couple of second class cars. When you can stay out of the herd and wait further down, there are less people who walked down that far with you and you will have a better choice of seats. We spent a hellish train ride between Lucerne and Zurich separated and with no where to sit while traveling by train with toddlers because we made the mistake of traveling during a busy time. If there aren’t seats together, sitting down next to someone in an empty seat with a toddler or two is often enough compulsion to make them get up to find a better seat and open up seats together for you. This might make me sound like a horrible person (especially if you are the one who is being basically forced to move) but you also probably wouldn’t want my toddler sitting next to you for the whole train ride and little kids really do need to be seated somewhere on a train for safety and other reasons. In an ideal world, my toddler would be able to stand patiently for a whole train ride not bothering anyone else. The reality is that toddlers who are not contained in one seat can become a bother to other passengers around them despite the best attempts of concerned parents to distract/occupy them. Many times when traveling by train with toddlers, we were not able to find a place to stow our stroller nearby. There were usually designated spaces in each train car for oversized luggage, but on a full train these were generally all being used. Try to see if there is a space for oversized luggage in your car first. If this failed, occasionally we had to leave the stroller folded up near the door of the train. It was usually nearby, but sometimes out of our eyesight. I was not worried about it being taken, but we would always remove our stowed items from it. ***TIP – We had an extra nylon strap with us that we used at times to secure the stroller and keep it tucked up against a wall. This might be a useful thing to have when you train travel in Europe with kids. 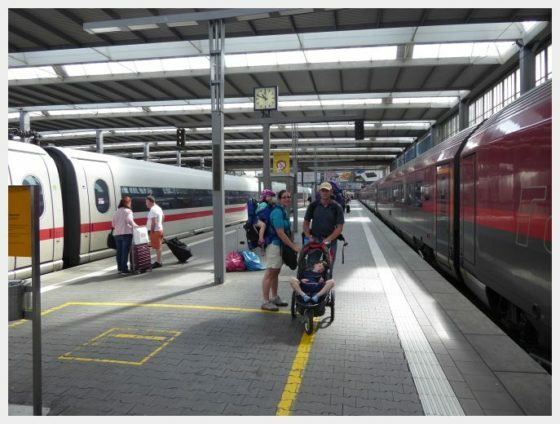 When looking to master train travel in Europe with kids, your trips will go more smoothly if you can take advantage of the great kids facilities that many trains in Europe offer. Some trains have play areas or movies playing for kids. Some have specific cars designated for kids. 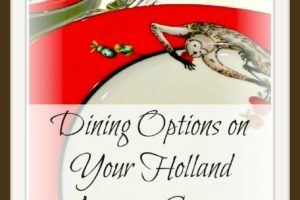 At the very least, you will want to know where to find the dining car. Ask before you get to the platform where the restaurant car on your train is and if there are any kid facilities (and where). This is not always self evident from the platform when you board. Once you are on, it will be hard to move your stroller and bags too far to get to them if you are not close already. 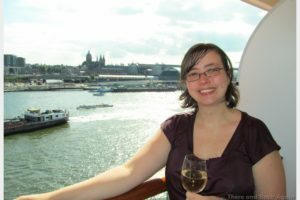 The website Seat61.com also has a TON of information and resources about traveling by train in Europe. 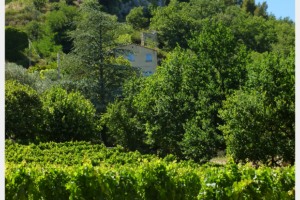 It is definitely worth checking out while doing your travel research. You can ask at the ticket counter or at the train information desk if there is one. When all else fails, you can try asking a train representative on the platform before you board. Do You Need to Upgrade to First Class? We never did during our recent trip, and generally had no trouble. The cost always seemed more than the benefit. In hindsight, we would have considered the extra cost worthwhile only once, when taking a busy rush hour train between Zurich and Lucerne. On this train, having seats ahead of time would have been worth its weight in gold as we ended up sitting on the stairs with the kids. Lesson learned. Happy Birthday! Reflections and Travel Blog Goals for year 2! Great piece from Europe. I plan to experience this next summer.